It’s all about learning to trust your intuition. Published in the March 28, 2013, edition of Salt Lake City Weekly. Ever questing, I've found these realms to offer clues as to why we're here and how things are unfolding: astrology, hand analysis and intuition. It's such fun to hear the bells bong when it all starts making sense. Let's delve into these mysteries together. 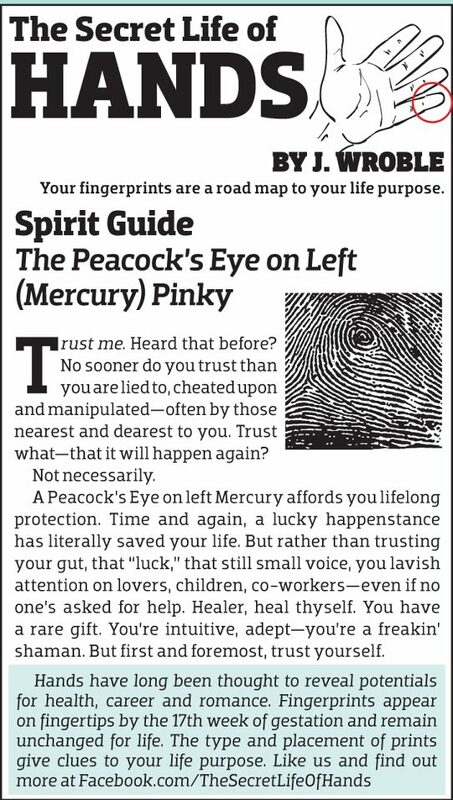 This entry was posted in Articles, Pinky and tagged Finger, Fingerprints, Hand Analysis, Hands, Life Purpose, luck, mercury, peacock, Protection. Bookmark the permalink.